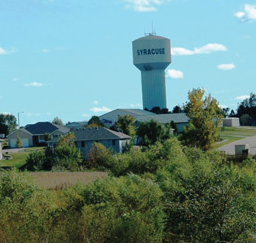 Syracuse is a city located in Otoe County, Nebraska. As of the 2010 census, the city has a population of 1,942. It is a second class city incorporated in 1871. The city is governed by a mayor and council. Departments within the city include electrical, water, sewer, public library and parks & recreation. Recently added was a meeting room that was converted from the Maintenance Shop at Williams Park. For reservations, please call the Parks and Recreation Department at 402-269-2601.